It's easy to forget, in this period of fresh Mario 'main' series platformers every 12 to 24 months, that the mid-'90s brought a notable gap between these releases. In part there was experimentation from Nintendo, and there was a trend of spin-offs and diversions - 1994 was one example. 1995 continued the trend, further influenced by the nature of console generations; the Nintendo 64 was on the way and the SNES was heading into its final stretch. Super Mario World - released in 1991 - introduced Yoshi to the world, the adorable companion that Mario rode around and occasionally sent to his doom when aiming for a hidden exit. It was clear that Nintendo had a valuable new character on its hands, and a little like with Wario Land: Super Mario Land 3 on Game Boy, the companion was given his own proper game - aside from some modest non-platformers - with a bit of Mario branding; we're referring, of course, to Super Mario World 2: Yoshi's Island. Just like Wario's adventure the Mario branding was only loosely valid. Yoshi's Island is a platformer, yes, but it's focused on exploration and Yoshi's unique capabilities; it operates at a lower tempo than Mario's adventure. It tackled some lore, too, with a storyline that necessitated looking after Baby Mario; it's a neat mechanic, but the crying sound of Baby Mario when floating away is famously irritating to some - if not necessarily all - gamers. Its design earned it many plaudits at launch and continues to do so in the modern day. The gameplay itself is full of clever ideas that are now familiar - such as throwing eggs at any angle - and it was a visual stunner. It took around four years to develop - a hefty undertaking - and it was Shigeru Miyamoto that reportedly drove the policy of adopting the hand-drawn effect. The SNES wasn't capable on its own of the various scaling and visual effects in the game, and as a result it required the Super FX2 chip in the cartridge; it's this technology that's typically highlighted as the cause for the original not coming to the Virtual Console, with the Wii U eShop receiving the Game Boy Advance port. It's still considered a masterpiece to this day, and the approach of arts and crafts recreated in visuals is a notable feature in current-gen Nintendo games, with Yoshi's Woolly World being a recent example. Next up in 1995 was a release that certainly counts as niche in Nintendo history. Mario's Tennis was a key part of the Virtual Boy library and packed-in with the hardware in North America - the quirky 3D portable system arrived and was pitched as a futuristic technical marvel, but its red and black hue combined with headache-inducing effects contributed to it being a major flop. It tanked, and never even saw a release in Europe. As a result Mario's Tennis is often overlooked - the apostrophe and s, along with an entirely different development team, sees it disassociated from the better-known Mario Tennis series. It was single-player only and a remarkably simplistic affair - it does feature Luigi, Princess Toadstool, Yoshi, Toad, Koopa Trooper and Donkey Kong Jr in addition to Mario, to its credit. Despite the limited mileage of this one it did have some nice touches, such as changing backgrounds. The main gimmick, of course, was the 3D effect. The camera angle suited a significant sense of depth, and though focusing the effect is tricky with the Virtual Boy it can certainly be argued that Mario's Tennis is one of the stronger examples of what the system could do. It should also be noted that Mario Clash, a sort-of spin-off from the original Mario Bros., would also arrive shortly after on the Virtual Boy. 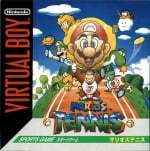 Mario's Tennis isn't a classic, but as a launch title for the Virtual Boy it deserves a respectful nod. We'll take this chance to pitch our Hardware Classics article for the Virtual Boy, too, if you want to know a little more about the system. Aww yeah, Yoshi's Island is my favorite Mario title, even over SMW. I loved the variety and the challenge was perfect. It took some skill but it never felt like it was unfairly difficult. Even getting perfect scores didn't feel too tedious. The game wasn't meant to be fast paced so you didn't feel like you were forced to slow down too much. For favorite platformers, it's a close tie between this and the DKC trilogy (or more specifically DKC2). Except that Yoshi's Island isn't a Mario title, it is the beginning of the Yoshi franchise. Yoshi's Island was the very first game I ever played and it is, to this day, my absolute favorite video game, period. I managed to get through all the levels as a 5 year-old, but I, obviously, didn't get anywhere near 100%ing the game until a few years later (I think I managed to pull that off the first time when I was 8 or 9). I feel like YI really nailed that balance between accessibility and still being a challenging game if you want it to be just that. It also still looks and plays wonderfully in my opinion and I fire my SNES (the same one I played the game on for the past 16 years) up every now and then just for this one game. And I'd really say that Woolly World is all around at least as good as the original. It does some things a little different and it's not without its smaller flaws but neither is SMW2. YI is an amazing game. I am replaying it on the (IMO) better GBA port. The level design is brilliant, atmospheric, and the color palettes chosen are pretty cool. BTW, whoever deleted my posts, was it that hard to just edit the part with the other user out? @Gridatttack In what way is it superior exactly? Aside from the extra levels it's worse. Lower framerate, lower quality music, worse (IMO) sound effects, cropped viewing area, brightened color palette, and some reduced visual effects. It's certainly playable and hardly the worst port job, but you're way off base if you think it's better. Seriously play them side by side, either on a RGB modded SNES or good PC emulation, and the GBA version next to it. It will be very obvious which is better on a technical level. @NintyMan It is one of the greatest videogames ever made! This is right up there with Super Mario Bros. 3, Super Metroid and Mega Man 3, in my book! @Gridatttack Oh it's fine if you prefer it, I'm just saying the GBA port isn't as good for a number of reasons. And again, try playing the SNES version again if you get the chance, ideally on a system with a RGB mod and either a RGB capable monitor or upscaler (admittedly expensive if you're not already into that stuff), or good PC emulation. You mentioned nostalgia glasses in your prior post (now edited), but some of us here aren't just going off memories from 20 years ago. I'm actually enjoying the visuals on old games even more than when I was a kid, since I'm not using RF or composite hookups. God those were horrible lol. @Gridatttack Yeah if you just hook them up directly to modern displays they'll look terrible. I personally use an XRGB-mini Framemeister, it's specifically designed for upscaling retro consoles to modern displays. There are lots of reviews on various forums and youtube, though the videos might not do it justice unless the video quality itself was good of course. To get the most out of it you need to mod the console however, though it's an easy mod. Main problem here is the expense, that device is pricey ($300 atm), but you can get emulator-like results on your TV using the original hardware, which is what the signal is really like before it gets downgraded over the crappy RF/composite connections. It can even add scanlines, which give the old 240p games a more authentic CRT look. And of course I don't expect you to go out and buy one just to compare games or anything, just throwing it out there that it's possible to get old systems to look good on new displays. @blackice85 Yeah, they are pricey, but I suppose its worth. I knew about upscalers before. One friend was looking for one. Will tell him word on the model you mention, as he was asking for options. I can actually hook my laptop to the TV and play there, with the gamecube controller adapter too. Will try to play again the SNES YI it in the foreseeable future. I will always have great memories of going over to my Aunt's house and much of the time I would spend all day playing Yoshi's Island on her SNES. All these years lately this classic title still holds up wonderfully. It's a long read but it's worth it before deciding to buy expensive equipment like that, so he'll know what he's getting into and what else he'll need to connect his consoles. Bottom line is that getting a good one isn't cheap, but the results are worth it if it's something you're interested in. @blackice85 Thanks for the info! It's between Yoshi's Island and Super Mario World as my favourite games of all time. On any given day of the week, either one of them could take the top slot. I also wish the SNES original of this game made it to the VC. I never realised how lacking the GBA version was until I saw a video on YouTube from the SNES version for the level "touch fuzzy, get dizzy". Compare that level between both versions and you'll see what I mean. Also the GBA version has that annoying noise from Yoshi every time you flutter jump. The GBA version is still good though. I am no technical expert, but I've never understood why they cannot emulate in 2015 effects which required a special chip 20 years ago. Or maybe the fact they did a half emulation back on the GBA (due to its limitations at the time) and now it is much easier just to emulate that version rather than take the extra effort to do a proper job on the SNES original. Shame really. Yoshi's Island is beautiful and has innovative and great gameplay, but is a bit frustrating too. I know what I'm saying because I got 100% in all levels including extra levels when I was a kid, but that's something I don't feel like doing again. On the other hand, getting 100% in Super Mario World is just bliss. Yoshi's Wolly World is better, in my opinion. I can't barely believe what Good Feel has achieved with Yoshi with their latest game. The levels, the visuals, the soundtrack, all the details they have recovered from Yoshi's Island and the added ones. Superb. Super Mario All Stars and Yoshi's Island should both on Wii U's eShop. Super Mario All Stars has the best Super Mario Bros. versions and SNES's Yoshi's Island is much better than the GBA version. Never heard Yoshi's Island abbreviated to 'YI'. This makes it someone from Newcastle's favourite Nintendo game, surely? @PigmaskFan except it is a Mario game. The clue is on the box, the bit where it says super Mario world 2..you could argue whether this was a marketing ploy to give this new experimental game more presence but regardless it will always be called Mario world 2. I'd agree the subsequent Yoshikawa titles aren't Mario games but this one certainly is. Still the best Mario 2d game for me, and quite possibly my favourite game of all time. I'd go bats hit crazy if they released the snes version, while the gba version is very good port, it's not a patch on the snes version. Yoshi's Island. Favorite game of all time. Perfect in every way. "Favorite game of all time. Perfect in every way." For many years I always considered Yoshi's island my favorite SNES/16-bit videgame and platformer. I loved the artstyle and the gameplay. But after all these years playing it in many consoles and versions, I don't think the same anymore. The exploration can be more tedious than fun and the collectathon is annoying. Also the levels are too big and stuffed. But the worst is Baby Mario, who passed from being a cool character to a crying baby. I still like it of cpurse but I think after all these years that DKC is definitely the best SNES platformer with YI in a strong second. @heyzeus002 Is not a Mario game. Is a Yoshi game. Different mechanics, layouts, rules and even the world. Just because it has Mario in the box doesn't make it a true Mario game. Heck, even DKC has more "Mario" than this one! Am I the only one who thinks this wasn't a collectathon? It's not like you had to make lots of detours or backtracking to get the red coins or flowers, most of them are along the route. And I'm the kind of person who usually doesn't try to 100% games because it's often tedious, but I didn't think that was the case here. For the most part as long as you were thorough about collecting coins and stomping posts, you wouldn't miss much. Any evidence to support the fact that Nintendo couldn't port the SNES version of Yoshi's Island to Wii U VC because of SuperFX? If this is true that is a pathetic excuse by Nintendo as any lame laptop and emulator can emulate SUPERFX games at full speed. @blackice85 I found Yoshi's Island tedious and boring on release. @GravyThief it's all about the money. Nintendo need an outside company to create the emulation as Nintendo do not have the technical skills to do so themselves. This outsourcing costs more money and being a low selling entry in the Mario series why would Nintendo bother? @liveswired Its not about the emulation. It has to do something about the copyright of the Super FX chip, which nintendo doesn't own it. Wooly World is a good game, but I think the bosses in the original were far more innovative. @liveswired Really? That's a shame, I thought most levels were a lot of fun and had a lot of variation between them. The only one that was a bit annoying the first time around was that one extra level that was a maze. Took me a bit to figure out the correct path, and I did miss some coins the first time. @Gridatttack That's how it always was for me too. Even way back on my very first playthrough I'd often get 100%, or nearly so, on the first try. Most of the time it wasn't so much that items were hidden, it was just a matter of not overlooking something as you progressed through the level. Yoshi's Island is an amazing game and yes,it looks cutesy and easy but it has some very challenging levels, especially if you wanna get everything. Nintendo was really into doing collect-a-thons at that point. @Tempestryke I guess maybe our definitions just differ a bit here. Usually when I hear that word, I think of a game that wants you to backtrack or take a lot of detours to get things. That generally wasn't the case in Yoshi's Island, the levels were mostly linear so as long as you collected coins as you went, you generally wouldn't miss much. It's not like the red coins and flowers were hidden in nooks and crannies everywhere, most of them were in plain view. The most easily missed ones were hidden in wooden posts you had to pound, but once you learned that and kept an eye out for them it wasn't bad either. No our definitions are roughly the same, but some of the levels did make it difficult to grab them. (Like the auto-scrollers for example) I'm talking in terms of Yoshi's Island, DKC Trilogy, Kirby's Adventure, the Mega Man X trilogy etc. All had you going back to those areas to look for stuff you missed. I'm not saying its bad, but VG designers do go overboard sometimes. @Tempestryke You're right there were a few like that, I think for the most part though it was fairly mild though. I just don't remember having to repeat most levels because I missed something, even during my very first playthrough. I think the worst offenders would be the extra levels, however they're supposed to be more challenging than normal. You're right some games do get absurd though, and I just say screw it lol. This game is really great and creative, and so is the GBA version. This is definitely up there with some of my favorite Mario games, if this game counts as a Mario game.